People like to say that "Science is self-correcting". Well, "science" is not a living entity, but people mean that scientists will make adjustments for new data and even discard theories and hypotheses if they are falsified. It amazes me that people will cling to a "theory" when the evidence is against it. I am referring to evolution. Instead of trashing the thing (which should have been done over an 'undred years ago), they hide evidence, make excuses, ignore conflicting data, proceed from presuppositions, conduct bad science (including outright fraud) and more. When anomalies were found in 1966, they were discarded because they did not fit with evolutionary presuppositions. Various soft tissues in dinosaur bones have been found, and excuses have been made. More discoveries, more excuses. 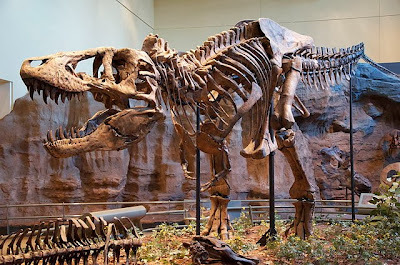 Now that blood and soft tissues have been found in Tyrannosaurus rex fossils, Mary "Iron Maiden" Schweitzer did some controlled, unrealistic and highly publicized experiments that do not prove much. 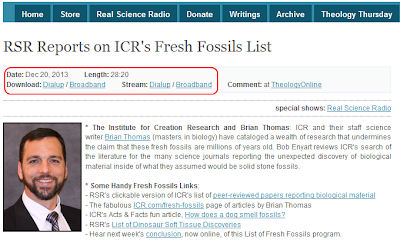 Bob Enyart's "Real Science Radio" has a two-part discussion of the many irritants to evolutionists and proponents of "deep time". These are documented not only by creationist scientists, but also by their secular counterparts. Unfortunately, the secularists refuse to admit the overwhelming scientific evidence that points to a young earth and recent creation. Something in the narrative stood out to me. Bob Enyart has been on dinosaur digs. You can smell the bones. They do not smell like rock, like they should if they were so many millions of years old. Someone who calls himself "Australopithecus" said, "Bob, if you’ve been on a dinosaur dig with people who think that dinosaur bones that they excavate smell like bones, then they’re either lying to you or mentally ill". I can't help but point out that this guy is using the False Dilemma ("Either/Or") Fallacy and sneaking in some ad hominem remarks, but is uninformed about other people's observations; his own secular scientists say the same thing. Later, he was abusive again and said, "...you'd know that if you understood what you read..." Disputing the interpretations of the evidence is expected in scientific procedures. Calling someone a liar simply because you do not like what they are saying is contrary to the true spirit of scientific inquiry. I wonder if "Australopithecus" knows about the dog that can sniff out fossils.